Osvaldo Sala, distinguished sustainability scientist and founding director of the Global Drylands Center at Arizona State University, has been named an honorary member of the Asociación Argentina de Ecología (AsAE). Honorary members are recognized for their extraordinary contribution to ecology as a science and to the functioning of AsAE. 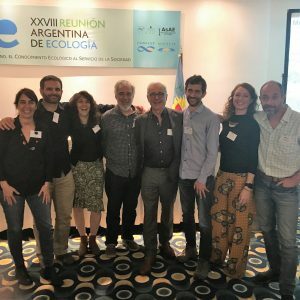 Sala was recognized at the XXVIII Reunión Argentina de Ecología in October in the city of Mar del Plata. The meeting, held biennially and organized by AsAE, included a symposium honoring Sala’s research legacy and commemorating the thirtieth anniversary of his 1988 seminal paper “Primary Production of the Central Grassland Region of the United States." According to the organization's website, AsAE is an association that “brings together researchers, professors, fellows, professionals and students from all branches of environmental science." A primary role for AsAE is to promote Argentine ecological research. The association also addresses the application of ecology to environmental problems and contributes to the management of sustainable resources. We congratulate Sala's important work with ASU and around the world.